AreYouCheating.com Is The Only "Cheating Search Engine" To Directly Connect Individuals With A Spouse’s or Partner’s Prospective Lover. By allowing users to learn if their partners or love interests are connected to romantic third party, AreYouCheating.com empowers its members to make better, more informed decisions regarding their sexual health and emotional wellness. Johnson and Williams believe the importance of their unique cheating search engine exceeds a romantic-only focus. “It’s about helping our members make more informed decisions about their sexual health,” shares Dr. Williams. Using the internet to flirt, research potential partners, date online and check up on old flames have all become much more common in recent years, according to a 2013 study by Pew Research Center’s Internet Project. Other recent studies have found that Facebook and Twitter usage have impacted the rise in divorces. Specifically, a team of researchers published a study, “Computers in Human Behavior,” which finds a robust correlation between using social network sites, experiencing a troubled relationship, and thinking about divorce. As the comfort levels for using the internet to research and establish romantic connections continue, unfortunately so does the rise in “online cheating” and “online affairs,” which can often result in sexting, swapping pics, flirty emails and much more. Enter AreYouCheating.com (AYC), a highly-specialized “cheating search engine” launched by co-founders and techpreneurs Justice Johnson and Dr. Michelle Williams, DC of Adelphi, Maryland. 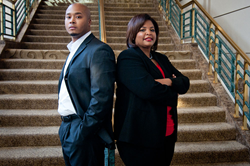 Johnson and Williams sought to use the internet to better enable individuals in relationships to take their online love interest research to the next level. Beyond wanting to help AYC members become better informed about their prospective relationships, the AYC-founding duo Johnson and Williams believe the importance of their unique cheating search engine exceeds a romantic-only focus. “It’s about helping our members make more informed decisions about their sexual health,” shares Dr. Williams. Now more than 5,000 members strong, AreYouCheating.com (AYC) is a valuable online resource for today's sexually active society. By allowing members to learn if their partners or love interests may be romantically connected to any third parties, AYC allows members to make better, more informed decisions regarding their sexual health and emotional wellness. To learn more about AYC or to join and become a member, please visit AreYouCheating.com. AreYouCheating.com custom cheating search engine results are tellingBy allowing users to learn if their partners or love interests are connected to romantic third party, AreYouCheating.com empowers its members to make better, more informed decisions regarding their sexual health and emotional wellness.